A direct geopositioning system monitors the position of a drone to a high level of accuracy, synchronizes this position to camera events and records information that can be used, in a post-processing step, to provide a priori estimates of the camera location for each acquired image. A direct geopositioning system is used to reduce the amount of ground control needed to achieve a specific level of accuracy or even eliminate it altogether in some cases, making direct geopositioning a tool that can improve both the accuracy and financial bottom line of projects. 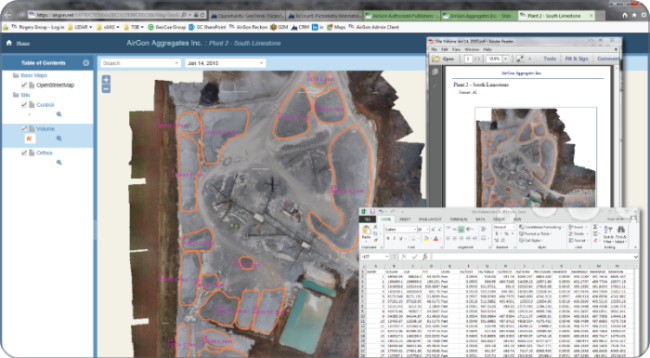 The detailed modeling performed in a typical drone mapping workflow uses a rich data format called a Point Cloud. However, most CAD and GIS software requires a regularized grid of elevation “posts” as their elevation model input. For example, a gridded elevation model with a post spaced on 1-meter (3 feet) intervals might be the preferred format for a CAD-based analytic operation. These Digital Elevation Models (DEM) are derived from point clouds that have been “classified” such that only ground points are used in generating the elevation model. Borrow Pit Analysis is a differential volumetric computation. 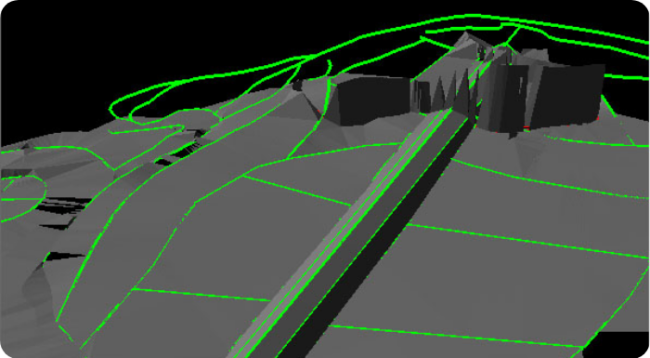 It is a specific application of cut and fill computations used in earthworks analysis. The goal is to determine the change in volume over time. This change may be a cut (where volume is decreased) or a fill (where volume has increased). 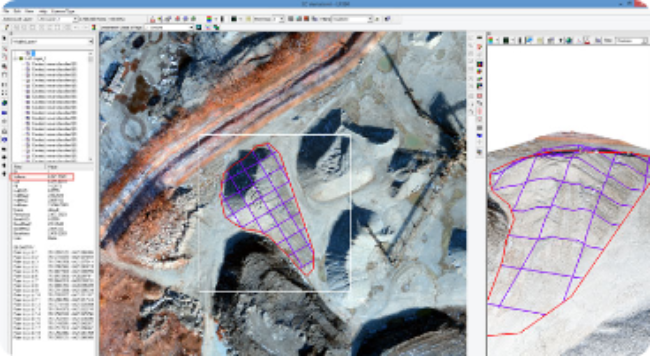 For example, if you are selling dirt from a borrow pit, the analysis is used to compute how many cubic yards/meters have been removed since the last time you conducted an analysis. Drone mapping is an excellent tool to use for differential volumetrics. The frequency of analysis is typically too high to support the high cost of manned aircraft remote sensing and the sites are often small enough to make drone mapping practical. However, great care must be taken in assuring consistent vertical references for the data. 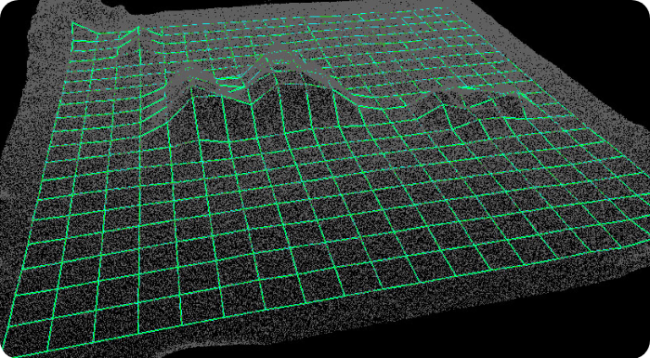 It is frequently the case in volumetric monitoring that an established base geometry needs to be used in the computations, regardless of the current topology. For example, a site may have been surveyed prior to the placement of stockpiles. After a period of time, the ground disturbance is such that this original base line data can no longer be directly measured. Instead, the measured baseline data must be added during the analysis process as a priori model constraints. Using model constraints requires specialized analytic software as well as high vertical accuracy relative to a common datum. Topographic (”Topo”) mapping is the process of creating a three dimensional (3D) model of the terrain (ground) of a site from data samples collected at the site using a drone-borne sensor. The output products can include digital contours, digital elevation files, cross sections, triangle models or discreate point models (point clouds). 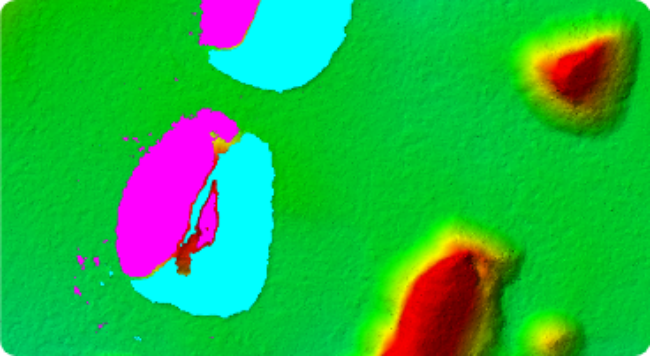 Source data for topographic mapping can be collected using either a dense image matching (DIM) technique or airborne LIDAR. 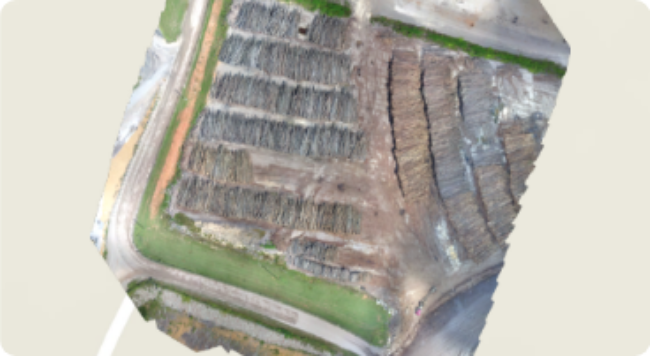 Small Unmanned Aerial Systems (sUAS or drones) along with exciting new image processing algorithms are enabling a fundamental change in how stockpile volumetric computations are performed. 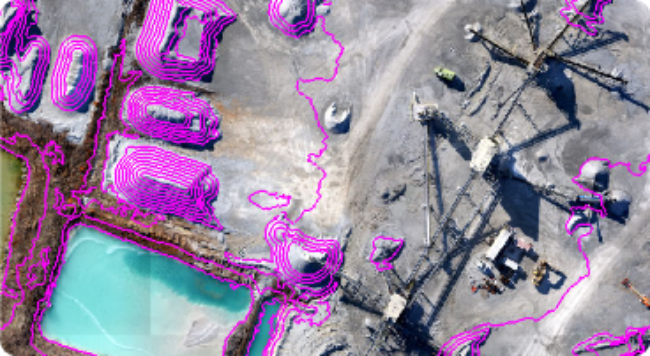 It is now possible to create accurate three dimensional models of stockpile areas using inexpensive cameras carried by a low cost sUAS (drone). From these 3D models, volumetric computations are easily derived. These new technologies result in significantly lower cost of collection, improved accuracy and non-disruptive data collection. Best of all, they keep data collectors out of harm’s way with collection performed from a low altitude drone. A Digital Orthophoto Mosaic (usually just called orthos) is a seamless mosaic of images that have been corrected for elevation distortions. They are often used to simply provide a “picture” of a site. If an elevation model of the ground was used in the ortho production process, measurements of distance and area can be directly made from the orthos. If a first surface model was used in the ortho generation (which is often the case in drone mapping software packages), you will still have a high-fidelity image of the site but measurements will not correct in areas where objects (trees, buildings, vehicles, conveyors and so forth) extend above the ground surface. An ortho is usually produced as a byproduct of nearly every drone mapping operation since they are so valuable for providing synoptic site information. When an ortho is the only desired product, more relaxed vertical accuracy techniques can be applied which generally decreases project cost. 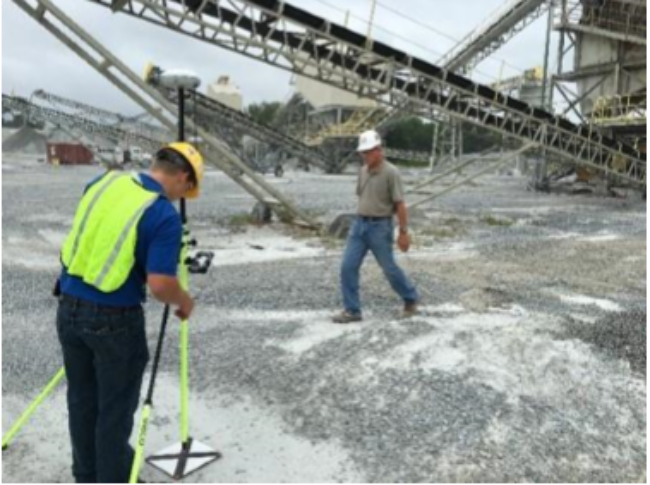 Drone mapping lowers the cost of small site mapping to such a degree that users tend to map much more frequently than was performed with prior technology. For example, a mine pit might now be topographically mapped on a monthly basis rather than quarterly. Many users of drone mapping technology are managing multiple sites. These factors mean that much more data are being collected and hence need to be managed. The natural solution is an environment that is light on IT requirements but provides easy access to users across an organization. AirGon provides Reckon, an Amazon Web Services (AWS) solution that allows a user to post results to a secure portal that provides a browser interface to authorized personal who have need to access the data. A simple example is a collection of several sites posting volumetric results that are collectively available to the accounting department. Reckon requires no IT infrastructure other than a PC for posting data and a browser to perusing results.